The Dining Room – Revealed! Well, folks, I took some photos of the dining room over the weekend. I’ll waste no time – here’s the reveal. No big surprise really, I suppose. I showed you our in-between stage, where the room stalled for about two years, shared my dilemma in trying to choose a fabric, and then walked through the reupholstering process and how the chairs look today. 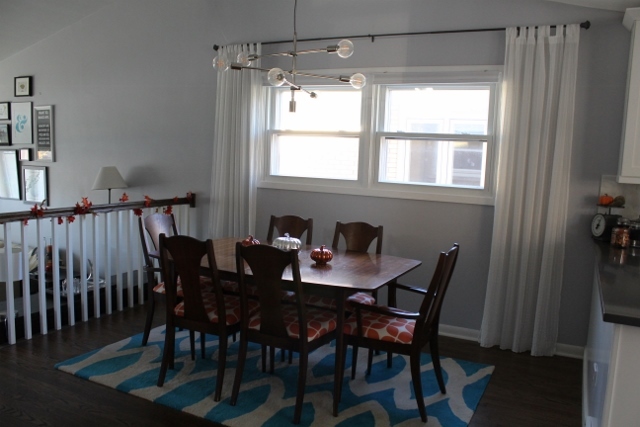 The only new item you haven’t seen before is the new lighting, which is the Mobile Pendant from West Elm, in chrome. I really do love the way the blue and orange look together. I had my doubts on whether we chose the right fabric as we were reupholstering the cushions. The rug is so bold that I thought we would be better off with a subdued, plain fabric for the chairs. But, I realized that instead of trying to keep the chairs neutral to off-set the rug, why not lean into having patterns in the room? The white curtains and light wall color lay a neutral pattern for the room, and the rug and chairs kick up the color a notch. Seeing all the parts of the room come together has been really satisfying. 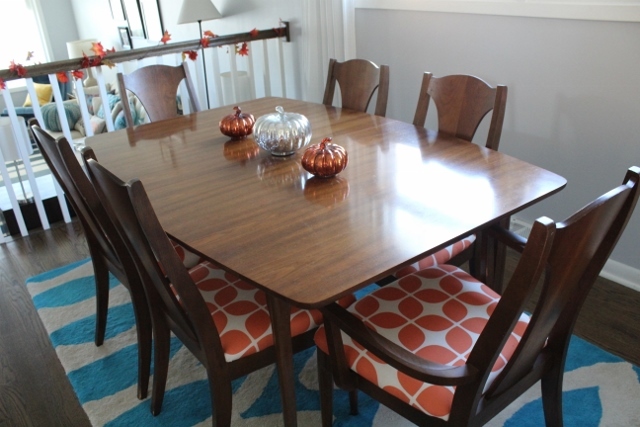 I especially love all the new life we breathed into such an old dining room set. I always knew we would replace the small table we had in the apartment, and I’m so glad we now have a table and chairs with family history. Beautiful! Congrats on completing this special project!